When you think of famous Shakespeare illustrators, Spanish surrealist Salvador Dalí may not be the first artist who comes to mind. 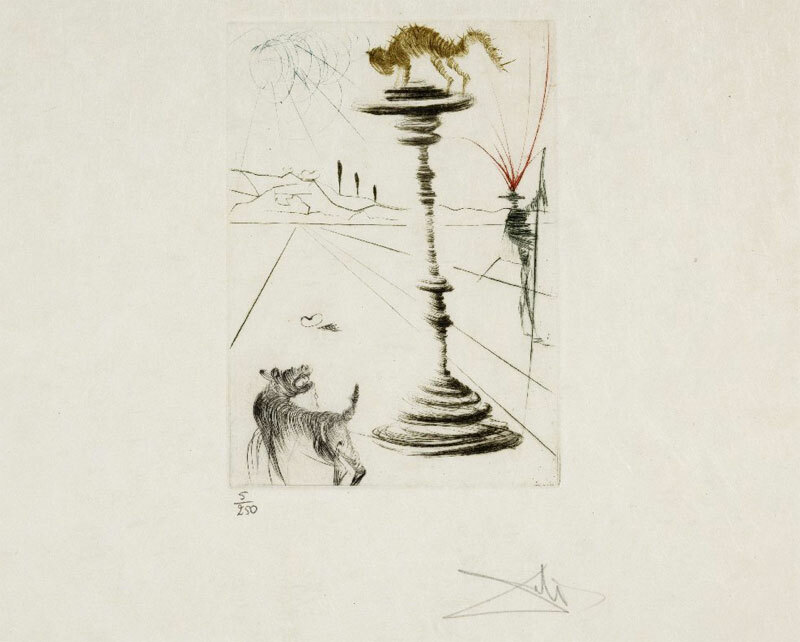 But the Folger collection contains a set of 16 etchings done by Dali, called Much Ado About Shakespeare, that brings his recognizable style to bear on these classic works. Each etching represents a different Shakespeare play: Love’s Labor’s Lost, Richard III, Henry VI (unclear which part), Richard II, Henry IV, Henry VIII, The Taming of the Shrew, Henry V (a & b), King John, All’s Well That Ends Well, The Merry Wives of Windsor, Cymbeline, The Two Gentlemen of Verona, Timon of Athens, and Troilus and Cressida. The etching for The Taming of the Shrew (shown below) can be found in the Folger’s digital image collection. Salvador Dalí. Etching from Much Ado about Shakespeare. Cadaquès: Editions Graphiques Internationales, 1970. Folger Shakespeare Library. ART Flat c20. Note Dalí’s signature in the bottom right. The most recognizable figures in this etching are that of a cat and dog, in what looks like an unfriendly confrontation, perhaps representing the battle of the sexes that plays out between the main characters, Petruchio and Katherine. You may recognize this Taming of the Shrew etching from the 2014 Folger exhibition Shakespeare’s The Thing. It was on display alongside a set of four color plates of costume and set designs by Dalí for Shakespeare’s As You Like It. Read about these designs and see more like them in this blog post on The Collation: Dalí as you like him. The other etchings in the Much Ado About Shakespeare set have not yet been digitized, but you can see a sampling of them here. Can you guess which Shakespeare plays they represent? Hover over or click on each image below to see the play title. In addition to a copy of As You Like It with Dali illustrations, I have a copy of Macbeth with a set of brilliant Dali illustrations.